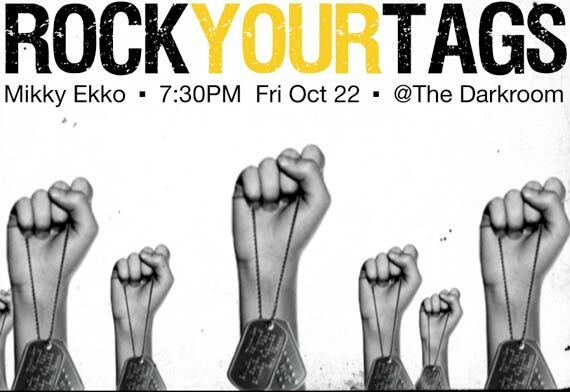 Project: AK-47, Brite Revolution and Mikky Ekko are joining forces to bring you the "Rock Your Tags" event! The night will be built on Project: AK-47's "Wear Their Reality" Dog Tag campaign, in which they've set out to rally 100,000 western advocates for the estimated 100,000 child soldiers of Southeast Asia. For more info on the campaign, visit www.ak47tags.com. Brite Revolution launched as a socially responsible, subscription-based music download service. What they've evolved into is a healthy community of music fans, independent artists and meaningful non-profit partners dedicated to the idea that music has the power to create positive change in the world. They build community to affect change and use music as the common language to bring people together. Join us for a night of otherworldly rock, great company, and real time advocacy for child soldiers!